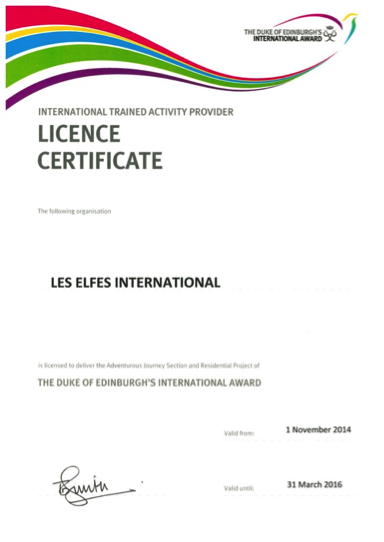 In 2014, Les Elfes has been licensed as one of the first International Trained Activity Providers (ITAP) worldwide to deliver the Adventurous Journey and/or Residential Project of the Duke of Edinburgh’s Award. We are the first ITAP based in Switzerland. From the beginning of December until the end of April, we organize ski trips to our prestigious Swiss resorts in Verbier, La Tzoumaz, and Crans-Montana. All ski trips are fully supervised and guided by professional staff and instructors from the moment the school arrives at the airport of destination. Our staff involved in delivering the Adventurous Journey section have completed the ‘Adventurous Journey Supervisor and Assessor Course’ in Chamonix delivered by the Duke of Edinburgh’s International Award Foundation. Situated in the heart of the Swiss Alps, Les Elfes offer a highly engaging Duke of Edinburgh’s International Award program at each of the three stages, Bronze, Silver, and Gold enabling participants to really use their imagination and creativity in designing their custom expeditions. While being on their adventurous journey, they will have the chance to hike in the Combin region, following trails near Crans-Montana.